De Pere, Wisconsin is not exactly Green Bay. Although it is part of the Green Bay area as a suburb. De Pere is located right next to Green Bay, and is full of homes, parks, schools, shopping and more. 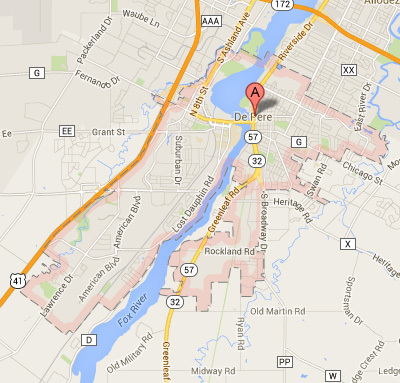 De Pere is broken down into East De Pere and West De Pere, divded by a bridge. De Pere gets it’s name from Claude-Jean Allouez, who if you read the post on Allouez, you’d know he founded that Village too. He claimed this site as Rapides Des Pères (rapids of the fathers) which became modern day De Pere. At first there was only the East De Pere community, but then what is now known as West De Pere consolidated into one strong community in 1890. East De Pere and West De Pere offers many parks and outdoor recreational activities. Besides parks, there are nature trails and boat launches. The city of De Pere has 3 boat launches to choose from. Two launches are located north of the De Pere Dam and one is located just south of the De Pere Dam. You can purchase daily passes at those locations or you can order seasonal passes. The main parks in De Pere are Voyageur Park, Legion Park, VFW Park, and Fairgrounds Park. Many people also enjoy fishing on the Fox River. You’ll see plenty of boats on the river in the warmer months. To learn more about the parks and recreation of De Pere, click here. De Pere has lots of wonderful and unique restaurants and bars. You can find drinking places anywhere from sport bars to wine bars. As for food and dining, De Pere hosts different ethnic foods. You can find Italian, Mexican, Asian, and more. Click here to see the list for East De Pere and click here to see the list for West De Pere! All types of styles on homes are in De Pere. The ranch style home is still considered quite desireable. You’ll find lots of tri-levels, and even the quad-levels. East and West De Pere do seem to have a lot of Cape Cod and Colonial style homes. The past year 314 homes were sold and new people moved in. The average number of days on the market was 62. De Pere is bordered by Allouez on the northeast, Ashwaubenon and Hobart on the northwest, the Town of Lawrence on the southwest, the Town of Rockland on the south, and Ledgeview on the east. What Homes are Available in De Pere? New houses come on the market in De Pere regularly so if can’t find that perfect house today, let Elysia know what you’re looking for and she can monitor the market and alert you when something meeting your criteria is listed. 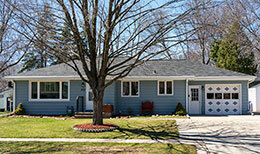 Click Here for a current list of homes for sale in De Pere.